Located in the heart of Key Biscayne, just a few minutes walk to shops and restaurants and a few blocks from the beach, parks, and award winning Key Biscayne Community Center, with state of the art exercise facility, lap pool, art and jewelry classes and more (fees apply). Key Biscayne is an idyllic island paradise approximately 10 minutes from downtown Miami and an additional 10 to 15 minutes to Coconut Grove, South Beach and the brand new Adrienne Arsht Center for the Performing Arts. This allergy-free 1 bedroom condo has separate living room with sofa bed, fully equipped kitchen and full bathroom with tub/shower. It was updated with eco-friendly low VOC paint and brand new furnishings. Eco-friendly and allergen-free products are used and supplied. The owner's assistant, who is nearby, Vonnie Betancur ,is available at danielsgroup@mac.com. She can assist with local information and/or organization of many special services. Note that Key Biscayne is a very safe, family oriented community with most services any guest would need. However, there are no nightclubs on the island. Miami Beach may be a better location for guests with that particular focus, however, it is only 20-25 minutes away. Richard g Cullin/Barbara C.East Stroudsburg, Pa. 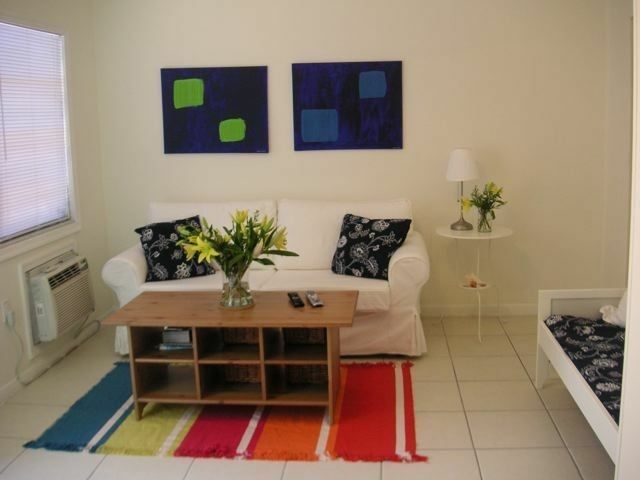 Cozy comfortable Key Biscayne living space for active couples. Minutes from midweek secluded beaches at Crandon, Bill Brags Parks, and apartments private arranged beach. Yet easy 15 minute drive to Brickell, and access to free metro mover for access to all of downtown Miami's Bayside, Riverwalk, AA Arena and more. Kitchen was space enough for only one, but promotes couple interaction. Amenities for beach time all provided. Bureau could be compacted with items in lower drawers to provide room for guest belongings. All other items one looks for comfortable stay are here. Perfectly located in the heart of KB! The Cottage was very clean and had everything we needed to make our stay an enjoyable one for my 3 kids and I! This place was perfect!! They even provided beach towels and an umbrella! They thought of everything. It made our stay so easy and relaxed. The place is clean and very comfortable...even the sofa bed. Getting around the island is a breeze. You can walk or grab a LimeBike... they are all over the island. Everything you need is at your fingertips. The pool is perfect and so well secluded that you don’t even feel like the shops are right behind you, and I had it all to myself every morning...it was one of my favorite parts of the day! We absolutely loved our stay and I won’t ever want to stay anywhere else when I come back! Thank you so much!! Plenty of room for 2 and clean! We arrived late and the code helped us get in. The unit is perfect for 2 or maybe 3 adults and the management takes great care of the place. A good deal for Key Biscayne! The rate includes one assigned parking space right outside your front door, wireless internet access, local and Nationwide calls, cable tv, building amenities including pool and laundry facilities (coin operated). Please note that our units are allergen free so we do not allow smoking or pets. If you would like more information on things to do in Key Biscayne or our units please visit our website www.keybiscaynecottages.com.